As a rule, I tend to stay away from face masks. They usually dry out my skin, make it tight and itchy, and just generally cause more harm than good. 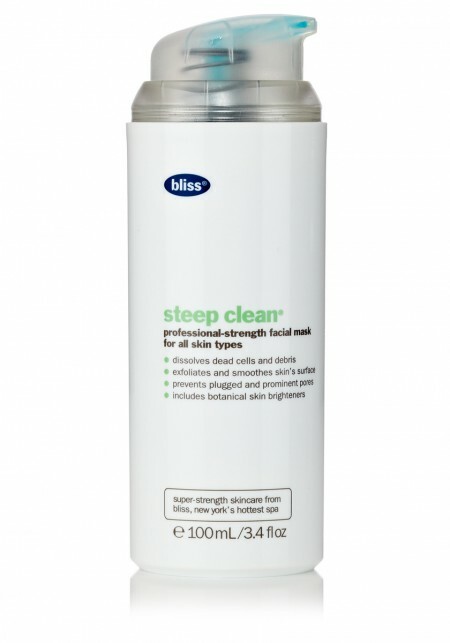 But something about the Bliss Steep Clean Mask really intrigued me. Maybe it's the fact that every time I've had a facial at Bliss, their products didn't make me break out and left my face glowing. Maybe it's because I am pretty much in love with any Bliss product, no matter what the cost! Or perhaps it's just because you only need to use this mask once a week for 15 minutes and it claims to unclog pores, remove dead cells and dark spots and clear otherwise unsightly complexions. Whatever the case may be, I took it upon myself to test this out over the last month. And today's edition of Must-Have Mondays? It's definitely the Bliss Steep Clean Mask. I must say that the bottle itself is quite fun to use. A dual pump dispenses two different colors of gel -- turquoise and white -- that, once mixed and emulsified in your hands, turn a vibrant shade of green. As I began spreading the paste-like substance on my face, it felt cooling to the touch and turned white. At no point did it begin to harden or crack over my skin, so I could still move my face and not feel like I had a Grecian mask over it that prevented me from showing true expression! Even after my first usage, I already began to see a difference. The terribly clogged pores and blackheads on my nose began to disappear, and my skin -- which had until this point had some splotchiness and redness -- began to even out. After subsequent uses, the pores continued to shrink, the blackheads continued to evaporate, and the dryness and itchiness that usually accompanies the cold winter months began to disappear! It's now been one month and I can honestly say this is my new I-can't-live-without-this-or-I-feel-like-I-might-die-tomorrow product. The Bliss Steep Clean Mask retails for $55 at blissworld.com. I bought this back when it was in its old packaging -- a squeezable tube that was impossible to get the right proportion of the two gels! I haven't tried the new packaging yet (I, uh, bought it, though, when my old tube isn't even near empty yet), but it looks like that fixed the problem! Still, even when the mix is off, I've really liked this mask and how soft my skin feels afterwards. This is a wonderful mask for congested skin! The Steep Mask makes my skin feel incredible and really helps keep it clear. jeanne -- definitely try the new packaging, it is much easier to use. shop -- I agree wholeheartedly! I love those hardened masks, they make me feel claustrophobic! jen hill -- I totally agree with you!